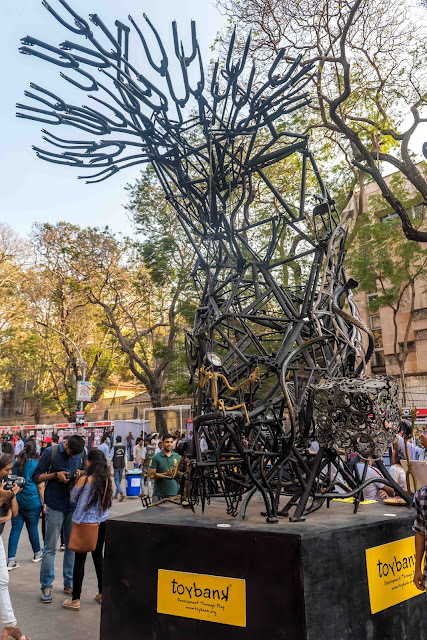 We collaborated with students to bring this sculpture together so as to stay in tune with our work - giving young individuals an opportunity to do what they love. 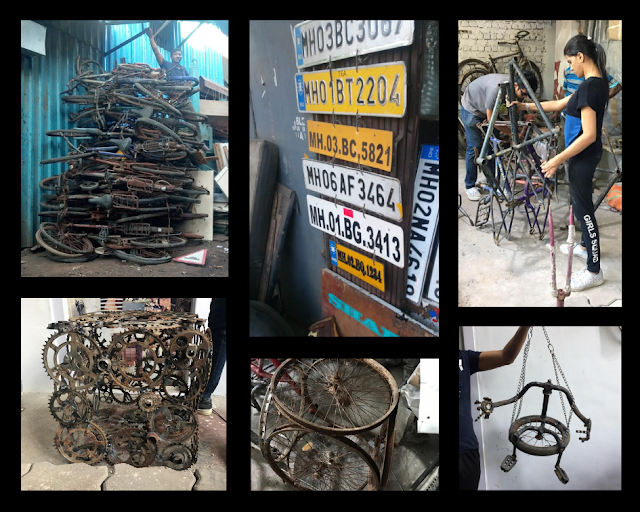 The sculptures primary element - cycles - in themselves embody a sense of freedom and direction that play enables us to achieve during our growing up years. 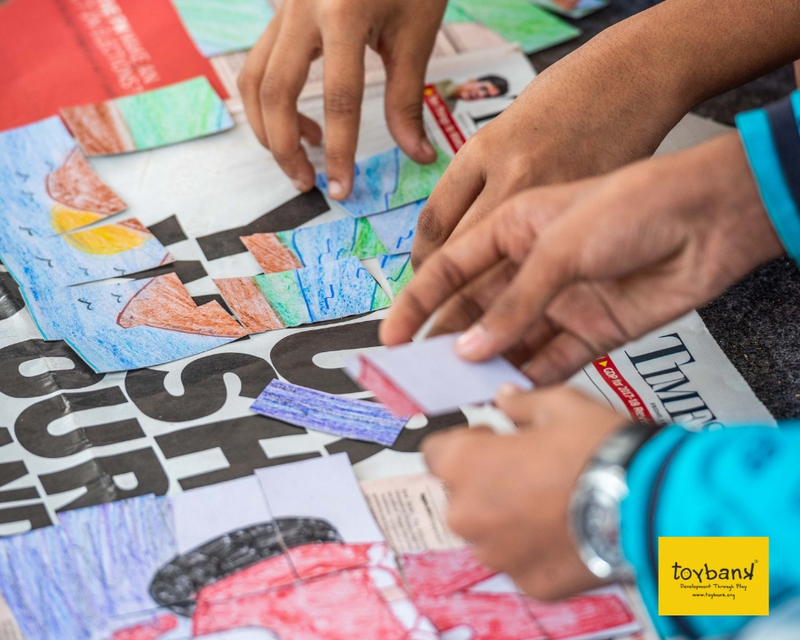 The young artists meticulously designed the sculpture to depict how every minute part of our childhood shapes us - even the games that we play and how often we play. 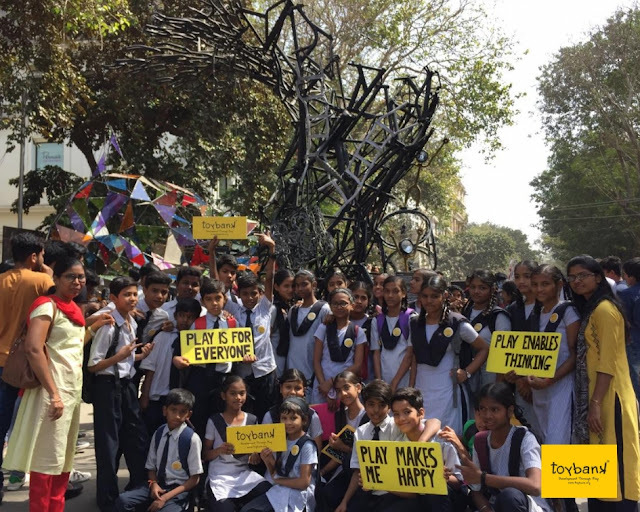 It signified both Play’s role in helping us learn better and in bringing us lifelong joy. As in trees, so in humans. A healthy childhood translates into a well-rounded adulthood. An integral part of our childhood is play, which brings happiness as well as develops life-long skills. Whether riding a bicycle makes you free spirited or a Rubik's Cube strengthens your strategic and cognitive skills or Snakes and Ladders prepares you to face the ups and downs of life or a kaleidoscope shows different perspectives, every game prepares you for adulthood. Missing out on play is like missing a cog in the machine. 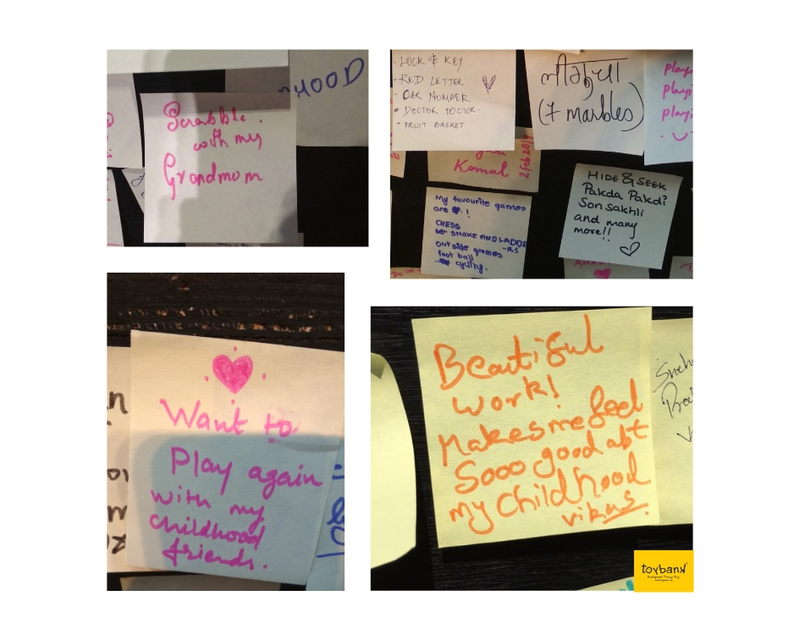 We also conducted a small activity near the sculpture to engage the visitors and to get a sense of what do people love about play and their childhood. 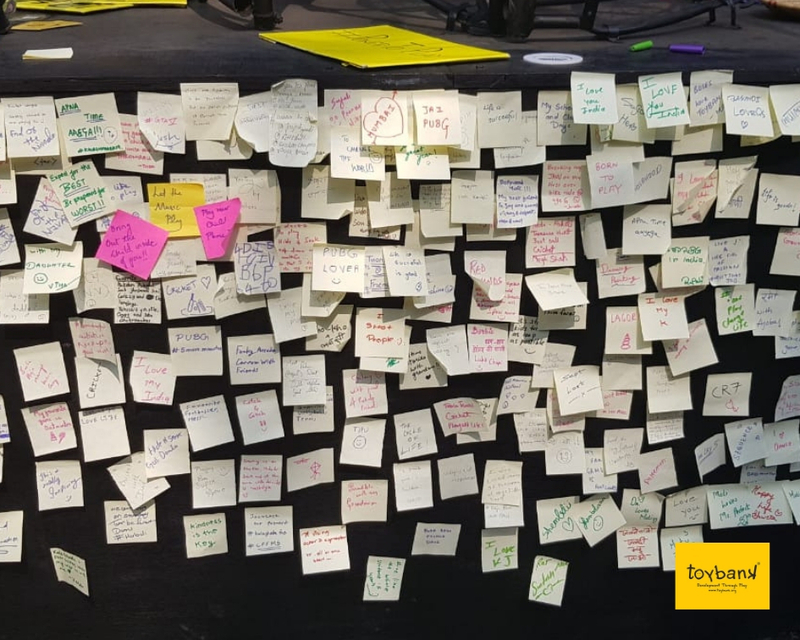 We left yellow post-it notes to write on and stick it to the base of the sculpture. 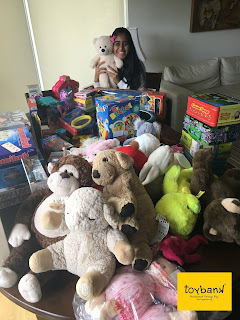 The response was overwhelming and everyone wrote down their favorite games, special childhood moments and also appreciation for the creativity of the sculpture. 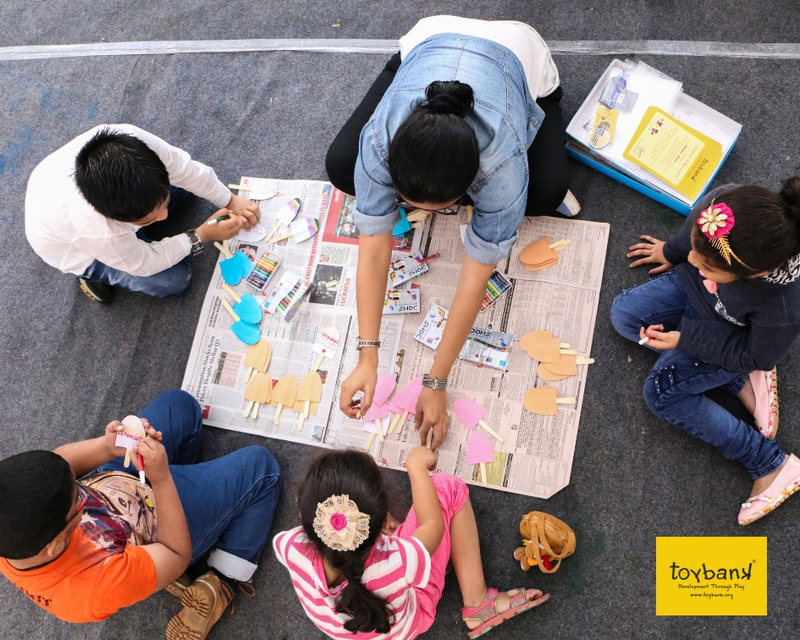 The children's workshop we conducted was called 'Our Playground'. 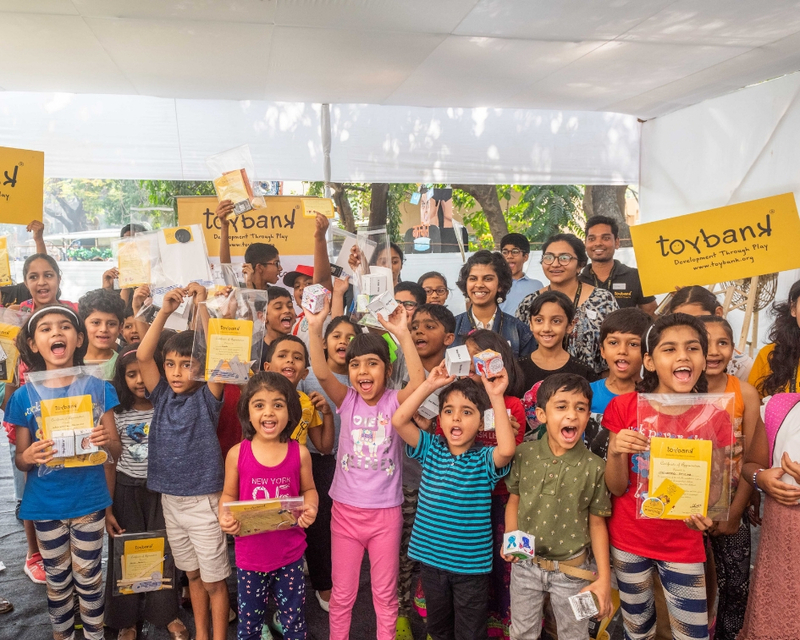 With a total of 70 kids, 15 volunteers and the Toybank team, we all came together to create our own little unique board games. 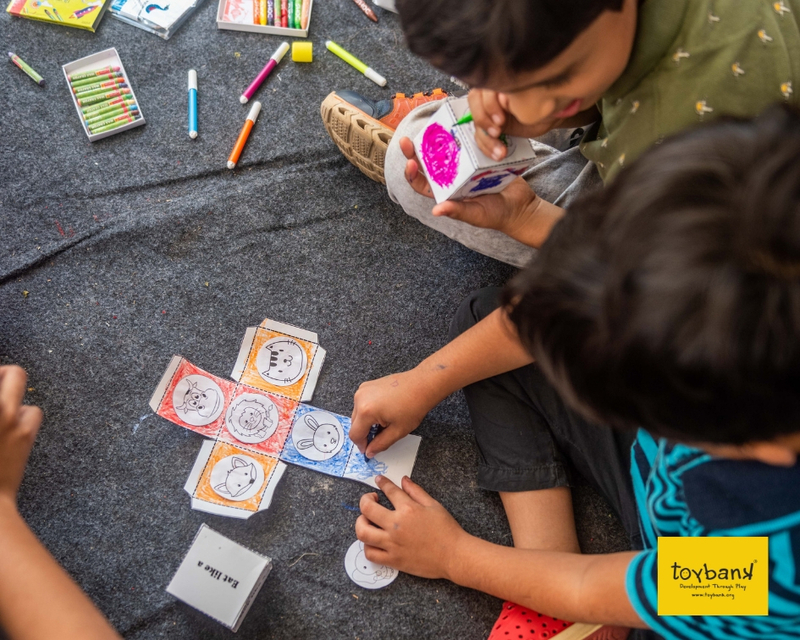 We wanted the children to put in their own efforts, ideas and express themselves to create a board game they could take home with them and play ! Children playing a memory game shaped as ice cream sticks. Before the workshop began, all of us gathered in a circle and had an interactive round of questions. 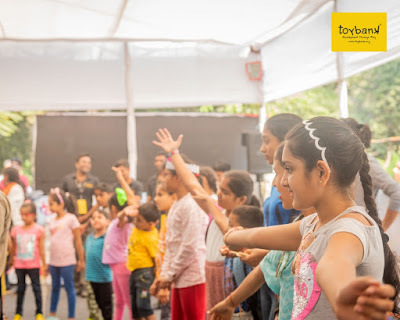 We asked the kids to stretch their arms and tell us how much they loved playing. Indeed their responses were super exciting ! We selected four games - Memory game, Animal themed activity dice, Jigsaw puzzle and Tic Tac Toe. 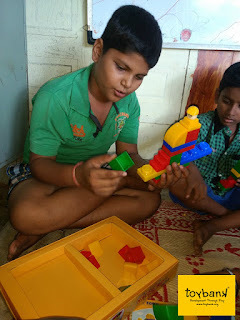 We grouped the children in groups of 7 where each group had to make one game using a craft kit that was filled with fun materials. A volunteer was present in each group to guide them. The craft kits provided them with basic layouts of the games on which the children could color and draw out their imagination and customize the game uniquely. It was quite a marvelous experience to watch the children patiently color in blank sheets with a scenery, butterflies, patterns and birds. 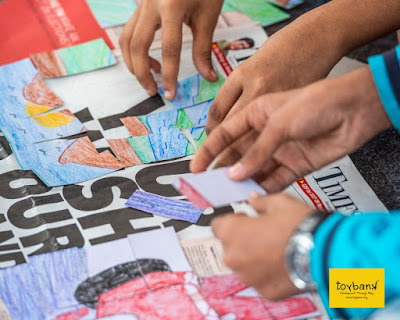 Soon after all their hard work, they were asked to cut them into blocks. This of course comes as a disheartening news but once they cut it and mixed it up, the coming together of the image from memory was a remarkable journey. This workshop was one of a kind. 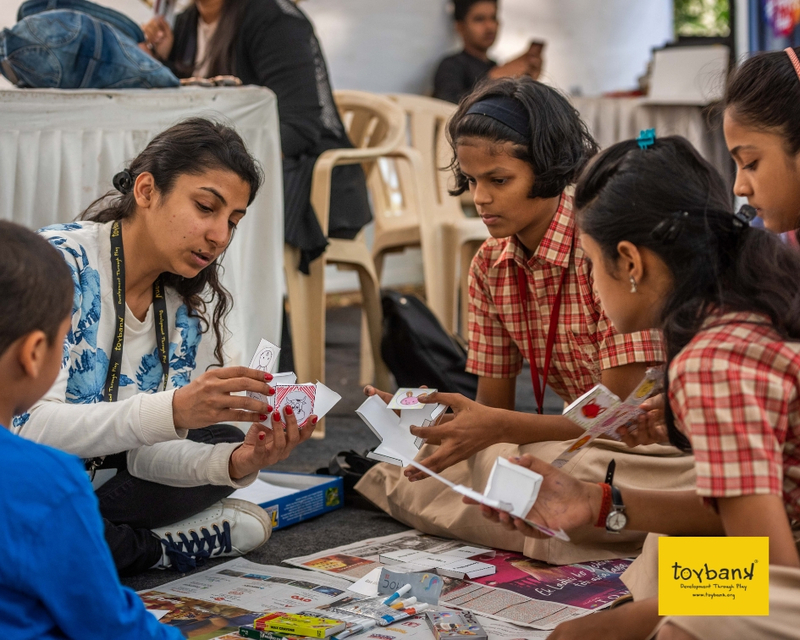 We're very used to playing with ready-made games and rarely do we know of the efforts that go into making something that brings out many skills in us and allows us to have a joyous time. As Mario Testino says, "My favorite words are possibilities, opportunities and curiosity. I think if you are curious, you create opportunities, and then if you open the doors, you create possibilities".